Never has pathology felt more personal than after walking the halls of USCAP, the premier U.S. Anatomic Pathology conference, this past March. The case studies, the patient tissue specimens illuminated on 10 foot backdrops, the innovative company research scientists there in the flesh, the faces of those working so hard to improve patient care…wow. Pathology is getting personal. 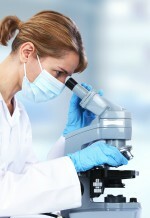 Statistics show that pathology is involved in 70% of all healthcare diagnoses.1 70%! Let that sink in for a minute. This means that it’s more important than ever that pathologists are at the forefront of the evolving dynamics in patient care. 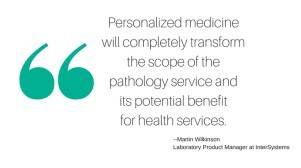 It’s no secret that the future is in personalized medicine. Advancements in genomics have opened the door to a whole new world of possibilities for prediction, treatment, and management of disease. Next-generation sequencing methods and multi-gene panels have already entered clinical practice. Molecular diagnostics are blurring the lines between clinical and anatomic pathologists. Pathologists are, in some cases, serving as directors of molecular pathology labs, as well as clinical labs. As advances continue, personalized medicine will become the standard of care, and the implications for pathology are significant. Martin Wilkinson, Laboratory Product Manager at InterSystems writes in Laboratory News, “the science of genetics will force pathology units and laboratory services to install more advanced facilities, provide training in new skill sets, and recruit staff that have the knowledge and expertise to interpret and diagnose based on new results and information. Personalized medicine will completely transform the scope of the pathology service and its potential benefit for health services. Take, for example, a patient who has experienced a stroke. With a $1,000 investment to understand the patient’s genome, clinical pathologists can quickly and easily identify the best anticoagulant for aftercare. This could cut the time the patient spends in hospital and improve the recovery period, while helping to identify the best protocol for rehabilitation in the community.”1 Not bad, right? This means that the traditional silo of clinical pathology is being deconstructed and rebuilt with some seriously impressive parts. As we strolled through the exhibit hall of USCAP, it was clear that genomics was moving in. Companies like Qiagen and Archer Dx displayed their NGS technologies for gene mutation profiling of solid tumors. Biocartis featured its fully automated PCR-based system with a menu of molecular tests for oncology and infectious diseases, offering access to personalized medicine in a variety of healthcare settings. Clinical service laboratories and research-focused molecular companies also manned booths to promote their value in the pathology space (Table 1). Table 1. Select molecular diagnostic companies at USCAP 2017. Advanced Cell Diagnostics (ACD) RNAscope® and BaseScope™ ACD’s products and pharma assay services are based on its proprietary RNAscope® technology, the first multiplex fluorescent and chromogenic in situ hybridization platform, capable of detecting and quantifying single molecules of RNA in situ. ArcherDx Archer® Anchored Multiplex PCR (AMP™) enrichment chemistry Archer® Anchored Multiplex PCR (AMP™) is a rapid and scalable method to generate target-enriched libraries for next-generation sequencing (NGS). Biocartis Idylla™ fully automated, real-time PCR based molecular diagnostics system Idylla™ is applicable for a wide range of clinical sample types and can analyze both RNA and DNA. The fully integrated system enables clinical laboratories to perform a broad range of applications in oncology, infectious diseases and beyond. Empire Genomics Cytogenetics, FISH, Next-generation sequencing, and genetic test menu offering Empire Genomics is a clinical molecular diagnostics laboratory offering testing for the anatomic pathology and oncology markets. Epigenomics Epi proColon® blood test for colorectal cancer screening Epigenomics is a molecular diagnostics company focused on blood-based detection of cancers using its proprietary DNA methylation technology. Epi proColon® detects methylated Septin 9 DNA in plasma via real time PCR. Perkin Elmer Sciclone® G3 NGS/NGSx Workstation, JANUS® G3 NGS Express™ Workstation, Zephyr® G3 NGS Workstation Perkin Elmer offers genomic solutions from sample extraction to data analysis which automate extraction, quantitation and next generation sequencing library preparation, accelerating an NGS workflow. Qiagen GeneReader™ NGS system QIAGEN offers a comprehensive range of Sample & Assay Technologies for molecular diagnostics, including automated solutions. Though not present at USCAP, other early stage companies such as Grail (an Illumina company) and Pillar Biosciences, with its single tube NGS library sequencing panels, are also keenly focused on the cancer diagnostic and precision medicine space with NGS technology. In addition to the clear presence of molecular technologies, the other prevailing theme within personalized medicine at USCAP was immuno-oncology therapy. As discussed in our e-Learning blog, the advent of companion and complementary diagnostics for immunotherapies is further expanding the pathologist’s role in the management of cancer patients. This requires that the pathologist be an active partner with the clinician not only in diagnostic decisions, but also in therapeutic decisions. It doesn’t get more personal than that. USCAP saw a number of companies showcasing their PD L1 checkpoint inhibitor tests this year. Agilent/Dako featured PD L1 IHC 28-8 pharmDx for OPDIVO® (BMS) (complementary diagnostic) and PD L1 IHC 22C3 pharmDx for KEYTRUDA® (Merck) (companion diagnostic), while Roche/Ventana featured its SP142 and SP263 PD L1 tests (both complementary diagnostics). Ascend Genomics, a CLIA-certified reference lab, and Biocare also featured promotion of their PD-L1 test offerings. (Pharma big guns AstraZeneca, BMS, and Merck sponsored their own booths as well, signifying the very real invasion of personalized medicine into the pathology world!) 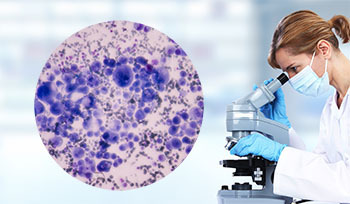 With the pool of available PD L1 tests increasing (Thermo-Fisher, AbCam, and others are launching RUO or CE-IVD/IVD test kits) and until industry standards are defined, it is critical that pathologists are given the tools to educate themselves on the nuances of each test in order to provide maximum value to the patient. The company has positioned itself as a partner for allowing laboratories to make this technological transition. Perkin Elmer has continued it immersion into pathology with the introduction of the Vectra® Polaris™ automated quantitative pathology imaging system, which visualizes, analyzes, quantifies, and phenotypes immune cells in situ, in FFPE tissue sections and tissue microarrays (research use only). The opportunities for pathology services has never been greater, and savvy marketers will be able to position themselves in this space if they can demonstrate a benefit to the pathologist’s ever-evolving role. As USCAP’s motto for the 2017 conference states, you too, can work toward “creating a better pathologist.” Consider a management consultation session to discuss how you can position your products in this very personal pathology world. To learn more about how we can support your work, visit Market Ready Rx. *Note that the above summary is not all-encompassing of the many innovative technologies displayed at USCAP 2017, but rather a high level synopsis of the direction in which the pathology market is moving.